This mountain scene is dominated by towering peaks in the gust of wind. Under the cloudy sky farmers are seen hurriedly collecting grains from the sunning ground and bringing them indoors, suggesting that it's about to rain. At the foot of the mountains is a multi-storied house with a covered stone bridge to the right and a veranda to the left in which a man standing by the balustrades is turning his head towards the direction of the front gate, where a dog is rushing out, greeting a traveller driving two donkeys across a wooden bridge paved with reeds and mud in the foreground. As the artist's inscription suggests, the scene refers to the mid-ninth-century poetic line 'The wind sweeping through the tower heralds a rising storm in the mountains', but he didn't seem to be interested in depicting the original melancholic mood of the poem. This painting is almost identical in composition to the scroll of the same title in much larger format in the collection of Palace Museum in Beijing. 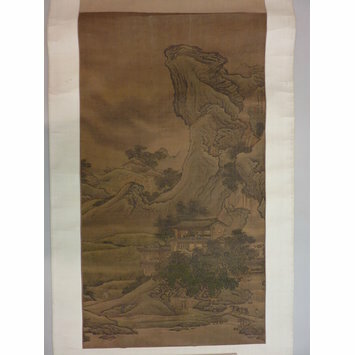 The V&A scroll is much cruder and rougher in execution, which can be seen in the treatment of foliage and the towering peaks. This scroll is possibly based on the Beijing version and was probably not made by Yuan Yao but by one of his contemporary followers such as Yuan Shao, although this is difficult to verify at the moment. 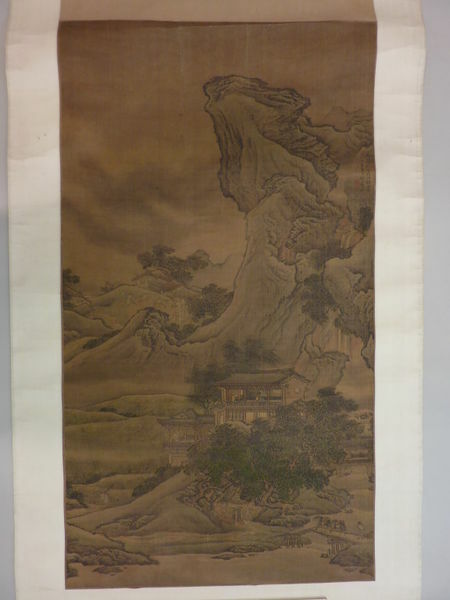 Artist's inscription: "Attempt to capturing the meaning of the poetic line 'The wind sweeping through the tower heralds a rising storm in the mountains', In the spring of yiyou year (1765) Yuan Yao from Hanshang (i.e. Hanjiang, Yangzhou in Jiangsu province). Artist's seals: Yuan Yao, Zhaodao. The poetic line is from a poem entitled 'Xianyang cheng donglou' (The City Tower in the East of Xianyang) by the late Tang poet Xu Hun. Pap, China, paintings and drawings. Attributed to the Yuan Jiang and Yuan Yao School, Storm in the Mountains, hanging scroll, ink and colours on silk, Spurious signature of Yuan Yao (active ca.1735-1788).